Exploring Traditional Chinese Festivals in China traces the history and development of various festivals celebrated in China. Many of these festivals have evolved into modern variations practiced in parts of China today. Some of these festivals have developed into popular celebrations that are not only practiced in China, but also in many Chinese communities throughout the world. 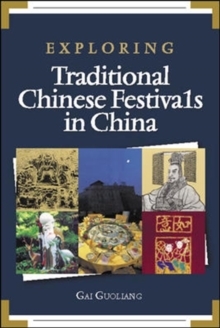 Drawing from archaeology, historical records, classical literature, and folklore, this book explores the development of some of these festivals in primitive to civilized societies, and the beliefs underlying the customs and taboos revolving around the preparation and celebration of festivals in China. This book presents readers with insights into the romantic charm of China's culture and encourages people of Chinese origin to cherish their invaluable cultural heritage.Exploring Traditional Chinese Festivals in China is one in a series of three titles. The other books in the series are Exploring Feng Shui and Exploring Traditional Marriage Customs in China.